When I was in Singapore this past weekend, I thought about flying on to Australia. It’s only a seven-hour flight. This guy made that voyage by water…in the opposite direction. Rubber Duck, a ginormous piece of conceptual art by Florentijin Hofman, was last spied bobbing about in Sydney’s Darling Harbor. 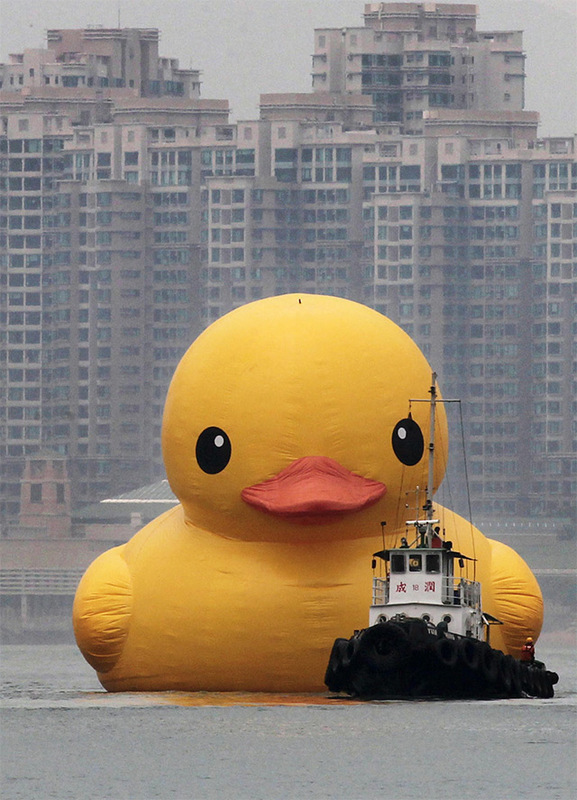 Today the inflatable duck, which measures 46 feet tall and 55 feet long, arrived in Victoria Harbour in Hong Kong for a month’s stay with a little help from a much smaller tug boat. Let’s call it a Duck Boat — it’s earned it! This entry was posted in Animals, Art, Humor, Life, Toys, transportation, Travel and tagged animals, art, Australia, Darling Horbor, duck, duck boat, flight, Florentijin Hofman, holy duck, Hong Kong, Humor, inflatable duck, life, rubber duck, Rubber Duck conceptural art, Singapore, Sydney, transportation, Travel, tug boat, Victoria Harbour, water voyage. Bookmark the permalink.